For a skier, July can be daunting. The air penetrates, and not in a chestnuts roasting, rosy cheeks sort of way. No, in July the air drives through your layers and leaves you a haggard, sweaty lump, not wanting to move because it’s too hot. It conjures escape. Far-fetched ideas like catching a plane to New Zealand or Chile are investigated. Hiking 12 miles each way to make some manky turns at Andrews Glacier is plausible, if not a necessary drug. At my place of work, it’s a blend between comedy, longing and desperation. The artistic component in my job comes from stacking produce, the way the oranges and apples slope, and I have begun to create great mountain ranges with fruit and vegetable being my medium. Yesterday morning I created the Teton Range on the mango rack. This afternoon I have a closing shift, which means lots of time to make nice stacks (ahem, mountain ranges). Perhaps the Karakoram Range with the kiwis, the mountains surrounding Zermatt with the apricots? One can create entire adventure themed parks with the various fruits and vegetables…the asparagus can be a giant forest…the lush wetlands below Mount Rainier, and then it can transition into rolling foothills composed not of lignite, but of mangoes. And finally, mountains and mountains, expanding as far as the eye can see, or at least across the citrus island. The ice tray holds special meaning for the wintertime dreamer. The asparagus and the artichokes live in ice. To get ice, you have to shovel it from a massive cooler into a large plastic container. Of course, when I’m doing this task (I always volunteer for it), I’m not just shoveling ice from the cooler for the asparagus and artichokes. No, instead I’m clearing way for a tent underneath a remote peak in remote mountains in northern Pakistan, paving the way for a first decent down a narrow, avalanche prone but oh-so-glorious couloir. Or perhaps my racer days kick in…the ice is actually snow to cover the rise on the Mausefalle on Kitzbuhel’s legendary Hannenkahm downhill course. The imagination is a powerful thing. My co-workers all ski. It seems the entire produce department used to live in Telluride, and we trade stories: they want the beta on front range backcountry, and I salivate over the prospect of a trip down to the San Juans this winter. It helps to be around skiers. It’s counseling during the dark days of summer. And then there is planning. Already my wife and I have committed to boot packing days at Silverton. Pack out the trails for two days, get two free skiing days in exchange. In the middle of July, when the temperature is 98°, this type of backbreaking physical labor seems like a day at the spa. Huts.com gets a lot of hits a day from me, scoping the calendar, looking for openings with “2” slotted besides them. We’re slotted into three trips already this winter, with more on the way. Finally, there are ski passes, trying to find deals and figure out somewhere to go other than the local hill, a mountain where we have spent too much time. 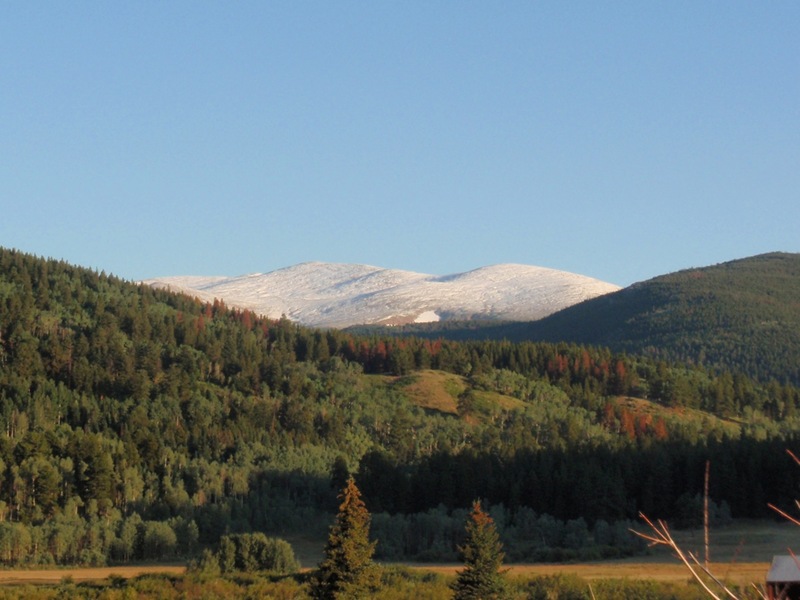 A student deal at Winter Park and Copper, but that five-mountain pass does look appealing too. Tough choices, and the decisions matter not. No, these are necessary diversions to the sweltering days of July. A few days ago my wife and I went into Boulder Ski Deals to look at skis and boots. We’re getting her some A.T. boots so she doesn’t have to lug her heavy race boots up the mountain. But it was more than that. Just being around skis, around ski gear, around skiers, provides comfort. More signs: the early fall catalog from Patagonia arrived the other day. And now that I no longer go to school, I love “Back-to-School” sales, as they also signify that the white stuff is coming, later than sooner, but still coming. And then it’s the gym. My wife Elaine and I are newly-weds, and we’re both skiers – I dare say good ones at that. We are beyond excited to ski together this winter, to slay mammoths together once again. We met on the hill and we know what we’re doing out there. But we’ve both been a bit adrift from the activity for a few years. The chaotic winter of 2009-2010 was my downfall and by the end of the season I was barely going at all. Her stay from the sport has been even longer, a prolonged three-year absence brought about by her fight to be healthy. But now, we are both healthy. And while we love hiking mountains, this year it feels like it’s not enough. So we hit the gym, diving into lunges, squats and core work, getting strong for the perfect arc through the crud and powder. Elaine is a big fan of plyometrics, hopping drills that I have not seriously done since I skied at C.U. that get you very fit and strong. So we’ve started those too: quick feet and explosiveness being the goal. Like I said, we’re both craving this season, and working out and doing something about it is much better than waiting for things to cool off. It’s coming. It’s inevitable. The orbit of the planet, the tilt of the earth guarantees it. We’re heading back to Ullr season. When I work an early shift I have to leave home at 4:15 am. Three weeks ago, it was light. Now it’s dark. The big stores that sell summer gear are about to have sales, with one purpose in mind: blow out the shorts and tank tops to make way for down, fleece and knit hats. The fall line-up at the Boulder Theater just came out, and the big three ski films are all there, Matchbox, Teton Gravity and Warren Miller, the annual gathering of the skiing tribe before the lifts fire up. A few years ago, I was biking to the first day of teaching at the high school and it was particularly crisp. I looked over at the divide and the leap hit my soul: snow on the high peaks. The first snow of the year. The date was August 19. Today is July 20th. Less than a month away. It’s coming people. Get ready, get your body strong, earn your money and work those extra hours, because when the first big storm rocks the Rocky Mountains, it’s not waiting for stragglers.